This post may contain affiliate links. For more information, please read our full disclosure here. If you’re into Law of Attraction and learning to create your reality on purpose, then you’ve most likely heard of the famous Abraham-Hicks. If you haven’t, then you should definitely check them out! We were first introduced to Abraham-Hicks in 2004. Esther Hicks is the conduit for the stream of consciousness (Abraham) and receives blocks of thought which she then translates into words. Ever since our first encounter, we have been applying and noticing how much of their perspective rings true for us. We can’t get enough! The message and the logic resonates on a deep level and does for many others as well. We thought we would recap the main understandings of their teachings for those that aren’t as familiar. This will also help you to better understand some of the terminology that we use in our blog. 1. The basis of your life is Freedom… the purpose is Joy… The result is Expansion. 2. You are a vibrational being. 3. You are a physical extension of non-physical. 4. You have an inner being with a broader perspective (Also called Source). 5. Your inner being knows what you want and holds the vibration of it and steadily calls you to it. 6. There is a Universal Law called the Law of Attraction which is always at work – like attracts like. 7. Your thoughts are frequencies and attract experiences into your life that are of the same frequency. 8. Your thoughts create your reality, or allow your reality. 9. You have emotions to guide you to what you want and what you have asked for. 10. Your emotions are the indicator of your opinion compared to the opinion of your inner being. Feeling bad means you have strayed from the perspective of Source, or Source disagrees with the thought you are thinking. Feeling good means you are in alignment with Source. Ask – Live life and experience variety and contrast. When you are aware of what you don’t want, you ask for what you do want (with your vibration, no need for words, this happens naturally, all day, every day). Source Answers – As soon as you ask, or know what you don’t want, Source lines up with the solution and holds the vibration of it. In other words, the non-physical part of you becomes what you are asking for and guides you to it with impulses and ideas. This is called the path of least resistance. You Receive – When you get into alignment with Source, you are in the mode of receiving. Regardless of what you are thinking about, whether it be about the subject of your asking or not, if you are feeling good you are allowing or receiving. If you are not feeling good, you are resisting what you have vibrationally become. 12. Thoughts, over time, have momentum. If they don’t feel good, better to catch them in the early subtle stages. Be sensitive to your emotions to catch the essence of your thoughts. 13. Meditation or sleep will stop momentum. 14. When you first wake is your most resistance-free, wake-state and is the best time to get momentum in the positive direction. 15. When you’re feeling bad, the best way to find relief is to make general statements that soften the resistance – ie: All is well. Everything always works out for me. 16. When you’re feeling good, that is the best time to get specific about your desires, milk the feeling for as long as you can. 17. You can’t get it wrong and you never get it done! You are eternal. 18. Beliefs are just a thought you keep thinking…. you can change these at any time. 19. You came to this earth experience for the fun in creating, to enjoy the unfolding. 20. Abraham does not recommend any diet or exercise plan, only to drink as much water as physically possible. 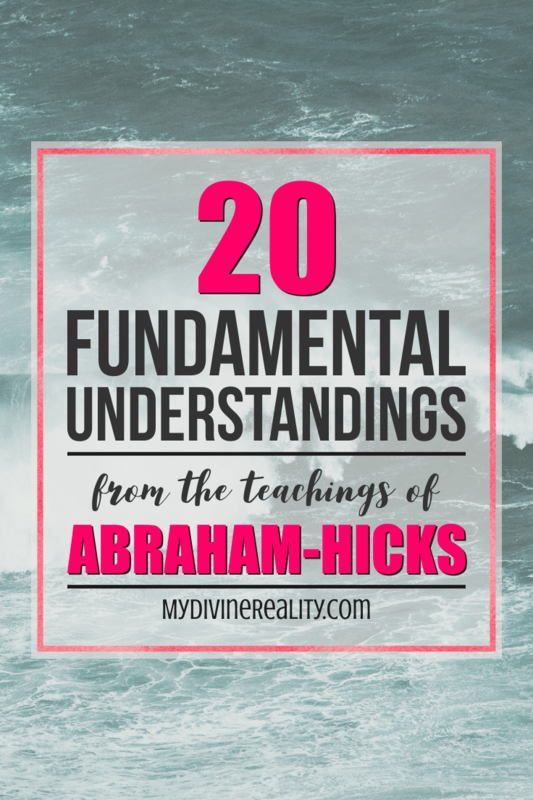 The powerful teachings from Abraham-Hicks have enhanced and changed the way we live our lives. We now understand and know for sure that we are creating EVERYTHING in our reality. If you too, are on the path of realizing your power and creative ability, we’re positive that their teachings will bring even more clarity to you. Click here to check out the official Abraham-Hicks website for daily inspiration, and to learn more! Comment below if we missed your favorite teaching from Abe! We are Mel and Kris! A coupla sisters from B.C. Canada. We created this blog to share tips and tools on how to CREATE YOUR LIFE ON PURPOSE! We want to INSPIRE you to LIVE YOUR VERY BEST LIFE! Thank you for visiting!